“Foot in the Door Career Programme” – A perennial issue facing SA youth, is what career to pursue, with many learners being misguided by their parents and teachers. To assist FLP Groups and members of the broader community, FLP’s Career Model supports the child’s holistic development and education from early infancy through our Early Childhood Development Programme, throughout their school career, and up until the time they can be placed in work. 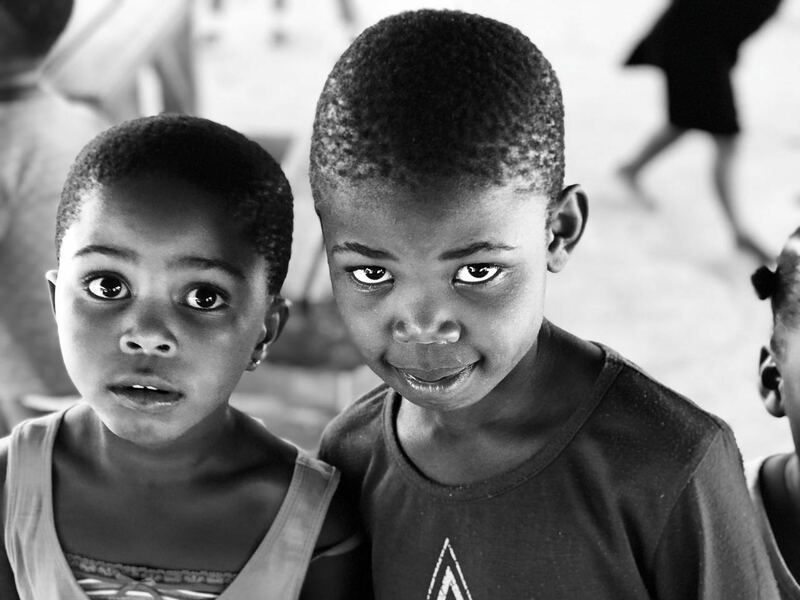 As a project that works in the deep rural areas of KZN, we are faced with a unique set of challenges and constraints, this commitment to the full lifespan of the youth is, in our opinion, the best and most reasonable solution. In South Africa, 3.4 million young people don’t have jobs, aren’t in school and aren’t getting a proper education – the Department of Basic Education (DBE) stats show that only 10% of children who start school end up matriculating, with the Grade 10 dropout rate currently sitting at 44.6%. With no income or education, they are likely to be poor and unemployed for the rest of their lives. Career guidance remains a poorly developed competence amongst the SA youth. As a result, most young people want to rush head-long to enrol at university, unaware of other possible career choices or vocational training opportunities. The FLP Career Counselling Team consisting of Xolani, Snoxolo and Jacqueline offer a Career Guidance Service to the youth in areas where FLP operates. We educate the Grade 9’s about careers on offer at the various institutions in SA. We guide them in their Learning Area choices for Grade 10 and then, in Grade 11 and 12, conduct Aptitude/Career Assessments with them. We assist the Learners to apply for entrance to Tertiary Institutions, apply for bursaries and access financial aid. Many graduates struggle to find employment post degree completion, whereas, learners who followed a specific vocation, do much better at securing gainful employment coupled with valuable work experience. Critically, young people need to enter careers they are passionate about. Studies have shown that being in a career you are well suited to, promotes individual happiness, while ensuring longevity in that role. In 2017, the FLP Programme assisted Students to register for suitable careers, according to their aptitude assessments, at Cedara Agricultural College, UNISA, Asifunde Sonke Teacher’s Training Centre, University of Pretoria, UKZN, Msunduzi, Plessislaer and Mzimkulu FET Colleges. This is addition to the Education and Tourism/Hospitality Interns being Trained by approved Partner Organisations – Noah’s Ark, Underberg Mastery Unit and Sani Lodge. Philangethemba Molweni Community – FLP trains and supports 12 ladies from Molweni Community for the Khulisa Abantwana Home Visiting Programme. This initiative is a partnership between FLP and St Agnes Church, which has developed a Community Centre in Molweni. Workshops are very well supported, with prospective Home Visitors excitedly receiving their bags, containing their Educational toys and Books, and venturing off into their community to commence their ECD Home Visits. It was encouraging to see that the African Storybook Project books, that FLP produced, piloted and translated, form part of the pack of books that would accompany the Home Visitors into the homes they would begin visiting regularly. The project is reaching the stage where Jill Frow and Florence Molefe will conduct an assessment to inform and guide us in the planning and implementation of Khulisa 1 and possibly the training in Khulisa 2 material should the assessment call for this. Internship Programme – FLP started this valuable programme over 3 years ago, to assist aspirant young ECD and Primary School Teachers in the FLP sites, to gain valuable in-service Teaching experience simultaneously to studying. Candidates that are selected as suitable, by FLP Group and Community Members, are then interviewed by FLP. There are currently 10 Teaching Interns in Noah’s Ark and Underberg School. They are required to perform all duties associated with Teaching and often will teach lessons, supervised by their Mentor Educators observing their practice. They receive a stipend that covers their studies, transport, accommodation and travel expenses. The students are encouraged to “pay it forward” once they graduate, by first offering their skill set acquired to their local rural, community schools. In addition to the Teaching Internships, another area where there is great interest as well as employment opportunities, is in the Tourism Sector. After receiving numerous requests from our groups to assist in this area, we are happy to have sourced training for Tourism Interns at a local Nationally Accredited Lodge. We are currently conducting a Pilot Study where 2 Interns are being trained over the next 2 years. We are currently exploring local Agricultural Training Opportunities for Interns in Underberg as this is an additional area where there is a call for Training. The National Read Aloud Day was celebrated in the FLP sites, schools and Libraries. Members of the community, teens and emergent readers all had an opportunity to read a Nali’bali story aloud, or if they were illiterate, to be read to. Almost 4000 readers from FLP sites and surrounding schools, where we dispatched Reading Ambassadors, participated in this campaign. “Enter Another World – Reach Out and Read” Pilot Programme – 5 FLP Teaching Interns, that have been trained by Shelley O’Carrol from Wordworks and the Underberg Mastery Unit, are working on foundation phase reading skills in 3 rural schools – Goxhill, Camanga and Underberg School. The Reading Programme aims to make reading fun and provide remediation to struggling readers. A baseline assessment was conducted and monitoring is taking place. We recently conducted the annual Reading Age Assessment of the Foundation Phase Learners and are excited to announce that learners reading ages range from chronological age to 3 years above their chronological age. This intervention, where FLP Interns visit 3 days per week in each school, to work intensively with Learners, and then encourage them to actively participate in the required 2 days of personal reading, is developing the confidence and ability of readers in the schools. We aim to promote reading as a leisure activity and not a punitive school practice. This is done by using dramatization, read aloud sessions with questions and bright books in local languages. The African Storybook Project Books are printed and form a big part of our corner libraries in these schools. A baseline Reading Age Analysis was conducted in January of 2017 and then in November of 2017. It was encouraging to see that the majority of children were reading at their Chronological level and up to 2 years above that. FLP Kwabhidla Community Library: FLP’s newest Library and community centre is completed and has opened for community use. The beautiful building is located on a piece of property that FLP leases from the Ingonyama Trust, adjacent to the Vusindaba School. The children are now able to read stimulating books and play with educationally appropriate toys outside of the classroom. The Reading and Homework Clubs FLP runs in the community utilise the new FLP Community Library daily – we currently open 6 days a week for schools and community use – many books are being borrowed by the community and we anticipate that the Centre will become integral in building Literacy Levels in the area. 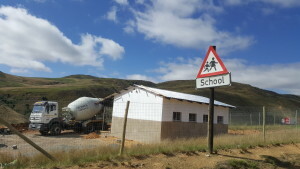 NPC Slangspruit Library – Because of the work that FLP has done in partnership with Valley Trust and Philangethemba in Molweni we have been approached to partner in a new community centre that has been built by Project Build with funds donated by NPC. There has been a request for Phumy to train and support the Library assistant to replicate the model that FLP has developed with our Community Libraries. 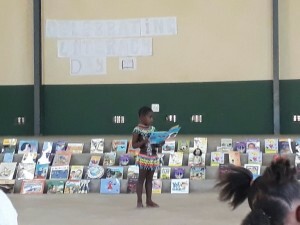 Ekelabantwana Library – The FLP Reading Clubs continue to be well attended with Rural Schools commenting on how much better FLP children perform at school. At a recent School cluster meeting, where teachers were discussing ideas on how to improve their learners’ performance, the schools where FLP Facilitators work encouraged their peers to encourage reading and develop their libraries. Enkelabantwana School Principal collected timber slats and commenced construction of a beautiful Library. He has contacted FLP to assist with this initiative by training and running Reading Clubs in his School. Phumy and Thola Mkhize, the Facilitator in the area, are running training sessions and have started Reading Clubs. We look forward to seeing Enkelabantwana School producing avid readers as result of their initiative! From Colorado, we travelled to Boston to present about FLP’s Community Libraries and the African Storybook Project (ASP). It was a privilege to be hosted at Primary Source and present to members of MRA, Educators and Rotarians from Boston. Judith Baker presented about ASP and the value of the work FLP has done in collecting, translating and motivating the writing of Zulu stories in our rural communities. The stories produced and their use in the FLP Groups and Libraries aroused interest amongst attendees with many offering to assist with translating the stories into minority languages in the USA to be used in Schools there. Frances Jefferies, a Rotarian from Boston, shared about the partnership that they have with FLP through MRA and the benefits that FLP derives from Rotary support. FLP was invited to Present at schools in the Seattle School District with whom we have had a partnership for the past 13 years. It was an inspiration to see the student led clubs working towards collecting resources for FLP and supporting our reading and literacy endeavours. A presentation was done for Teeter International, as one of FLP’s major funders. All staff were present and the CEO spoke about their contribution to development in SA and particularly the relationship to, and support of, FLP. To refine our partnerships, thereby deepening the impact and broadening our reach, we have discussed future exchanges between CCFL, Generation Joy Foundation, the Seattle School District and FLP. We hope to develop new approaches to engaging Learners in the USA to engaging fulfilling academic relationships with the Family Literacy Project Group members, Learners in our Programmes and the rural schools where we work. Rylie Teeter of CCFL has agreed to assist us in planning and developing a sustainable model to use. The FLP team members are the people that keep everything together – we certainly would never be able to meet our objectives without their committed, experienced approach that has been built up over the years. I also thank our funders who see the value of our work and support us in so many ways. And finally, a big thank you to all the friends of FLP who send gifts of money and resources that are so gratefully received by our beneficiaries – beautiful dolls from Uthando Dolls in Australia, books, blankets, balls, teddy bear, gloves, caps, toys … every single item sent is a valuable part of making our work a success.